Riding motorcycles in the snow initially sounds like a bad idea. If there is a snowstorm or it is sleeting, it is best to wait out the storm if you want to ride or your risk of injury is substantial. If you ride, you know that the temperature you feel will be at least 10 degrees colder than the outside air. Warm clothing that is not restrictive and which provides optimal protection from the wind and wet conditions and from falls is essential if you want to enjoy the ride and arrive safely at your destination. Here are some suggestions for what to wear while riding in the snow. Full coverage helmet with ski mask or scarf. Be sure to fully cover your neck. Get a windshield that extends below the headlight to minimize wind drawing up from below. Leather jacket with thermal liner if it is very cold outside. Consider one with a belted waist. Electric vests are available as are electric socks but be aware that they become too warm. Fog shield or use antifog solutions for your goggles or helmet shield. Be careful on bridges and be aware of black ice. Bridges freeze more easily since there is no ground beneath them to warm it and black ice can form in shady areas. Keep a safe distance behind other vehicles. Take more time for stopping. If you become too cold, stop and get a hot drink and dry off. You risk hypothermia if you begin to shiver and your judgment will be substantially affected. When riding over ice, squeeze the clutch and free wheel over it while keeping your feet off the road surface. Snow motorcycle accidents do happen from either riding too fast or not preparing for slippery conditions, or from other motorists who fail to see you or who lose control of their vehicles. Every motorist must exercise ordinary care when driving, which includes taking the precautions that an ordinary driver would take under similar conditions and circumstances. If a motorist is driving at the posted speed limit but conditions are such that a slower speed is much safer, then that individual could be deemed to have breached the standard of care and be found negligent if his or her conduct led to an injury accident. 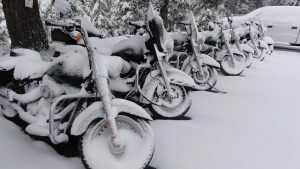 As a motorcycle rider, your own conduct will be highly scrutinized since insurance adjusters and defense lawyers will question your judgment in riding with snow on the ground. If you take the proper measures in insulating yourself from the cold and precipitation and ride with appropriate care, then you will have exercised due care and not be found totally or comparatively liable for causing your own injuries. Motorcycle accidents can produce devastating injuries since the rider has little protection in collisions with other vehicles and if ejected from the bike to the road surface or into other objects. Any accident, regardless how minor, can produce a serious injury. You can protect yourself to some degree from head injuries and skin lacerations if you do wear a full faced helmet, leather clothing and insulate yourself from the cold and wet weather. Comminuted fractures, spinal cord injuries, traumatic brain injuries, severe burns and skin damage and disfigurement are common injuries in motorcycle accidents. In any injury claim, retain the services of an experienced injury lawyer who can fully investigate your claim, obtain all necessary documentation and negotiate a satisfactory settlement for you. 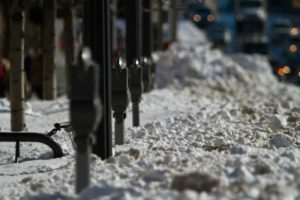 Burns & Jain is a Boston personal injury law firm who has handled numerous snow motorcycle accidents for his injured clients over the more than 25 years of his practice. Motorcycle accidents involve different issues for the legal practitioner to consider including proper operation of the bike, the conduct of the rider, how other motorists perceive a rider and the often biased attitude of law enforcement and insurance adjusters toward riders in general. If you were injured in a motorcycle accident in the snow or at any other time while riding, call the Law Offices of Burns & Jain for a free assessment of your injury claim.